This garden property is certified as a wildlife habitat. Hawks nest high in the cottonwood trees, and hummers build nests at a lower level to enjoy the symbiotic protection of the hawks. The front courtyard is cozy, and charmingly planted. As you enter the front gate, you get the feel of a cottage garden. The curved walkway to the front entrance of the home is surrounded by an abundance of spring flowering perennial plants, wisteria vines, and New Mexico privet shrubs. The combination of turf and mature cottonwoods creates a cooling oasis in their back courtyard. 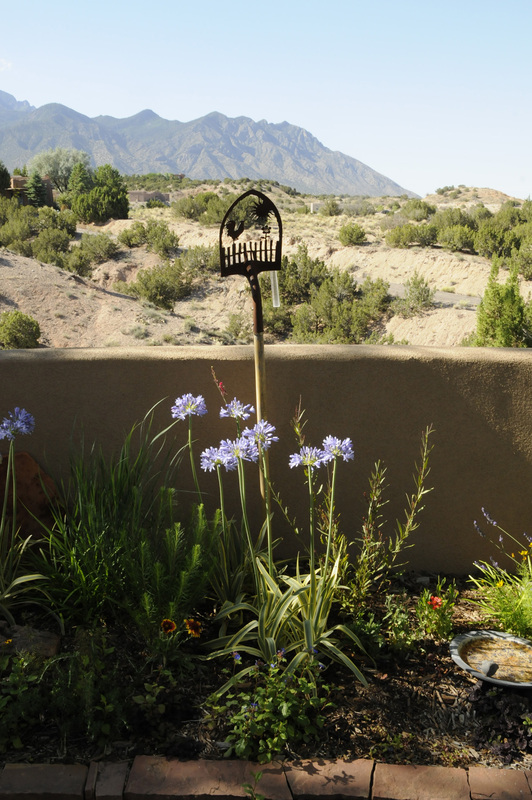 The large cottonwood trees serve to frame a spectacular Sandia mountain view from their back patio. The patio is bordered by an upright wisteria tree and arbor. The home was featured in the Albuquerque Journal in 1968 as a unique in-the-round construction project. Small juniper shrubs were planted in the front along with the placement of large landscape boulders when the house was built. The juniper shrubs are still present today, but now over-shadow the landscape boulders. The 360-degree landscaping, consisting of a wide variety of trees, shrubs, vines and perennials plants, was completed gradually through the decades by the owner on this open property void of courtyard walls. 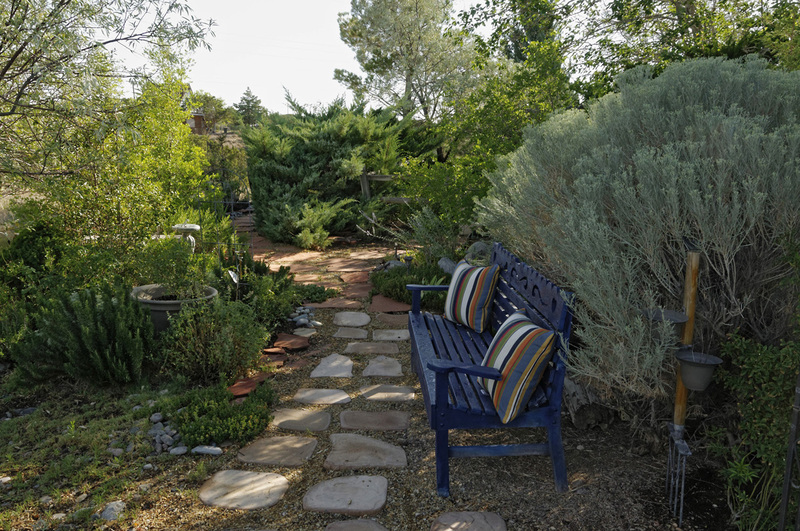 The European Garden is a hidden treasure on this corner property in Placitas. From the street and the driveway this garden appears to be an expansive well designed xeric garden with defined rock bordered areas surrounding juniper, grasses and other native plants. The landscaping in the back courtyard is the opposite in concept from the front landscaping. 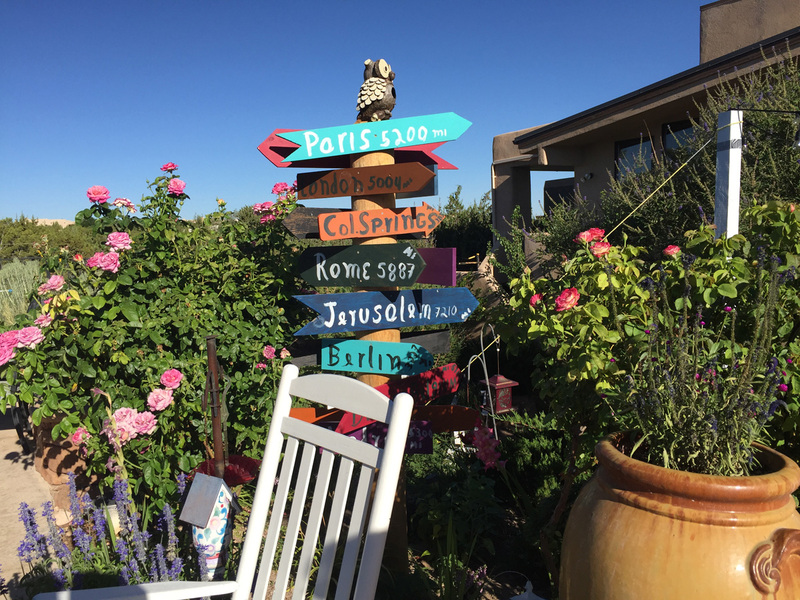 The back patio area is planted lushly on multiple levels with abundant rose shrubs and flowering bulb plants along with trees and other shrubs in the European tradition and is highlighted with touches of colorful pots, whimsically painted benches and a large directional sign sculpture. The back courtyard garden is an unexpected and visual garden treat. This is a spectacular property landscaped with several outdoor garden rooms. The tour starts with a walk up to the front entrance of the home through a freshly landscaped courtyard. A guide will lead you through the foyer to an indoor atrium garden planted in-ground under an open stairwell leading to a landing. After exploring the atrium garden you will walk through a breeze way enclosure with a south view of the outdoor pool with a large back bordering rock fountain as you exit. From the pool deck you may follow more than one path to different outdoor garden rooms. This public garden was developed by Placitas Community Library (PCL) volunteers with financial aid from grants. The garden is maintained by PCL volunteers in cooperation from Sandoval County Master Gardeners. 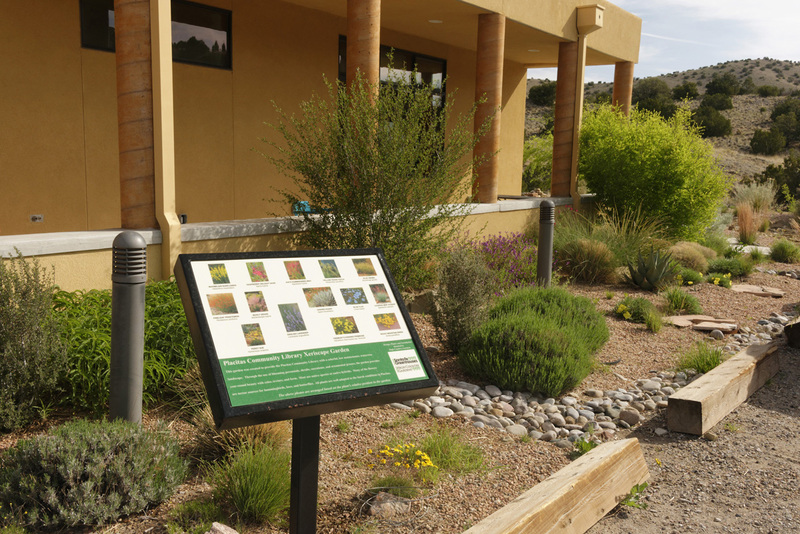 The front entrance plot consists of xeric plants donated by David Salmon, owner of the former High County Gardens, for the grand opening of the PCL building in 2008. Special features of the PCL garden are an advanced rain water harvesting system, a solar operated wildlife water guzzler, and an inspiring labyrinth rock garden designed and built by volunteers. Native plant specialists will be available during the tour to guide guests. The owners worked with what nature provided in the landscape. 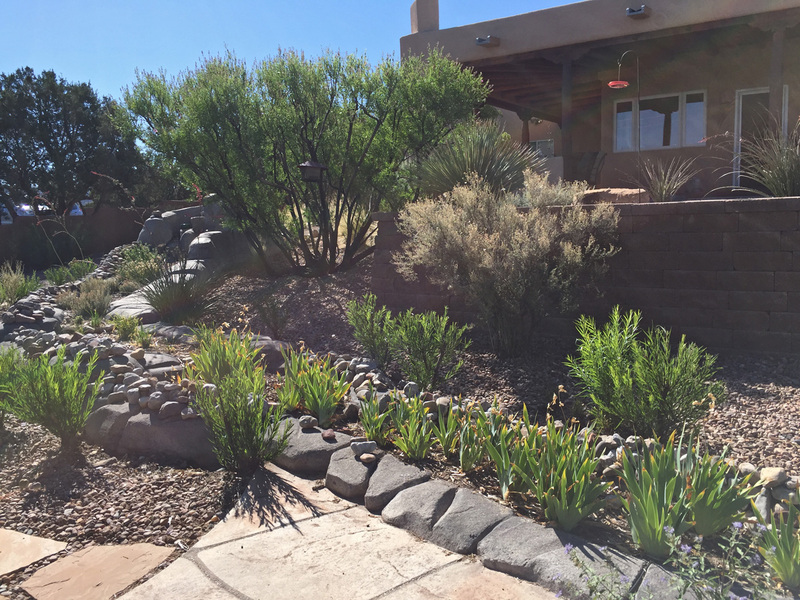 They planted cacti and irises in abundance in garden beds on the north-west side of the home among naturalized desert willows, red yucca, and New Mexico bird of paradise. The iris bed flowering should be in its prime for the garden tour. 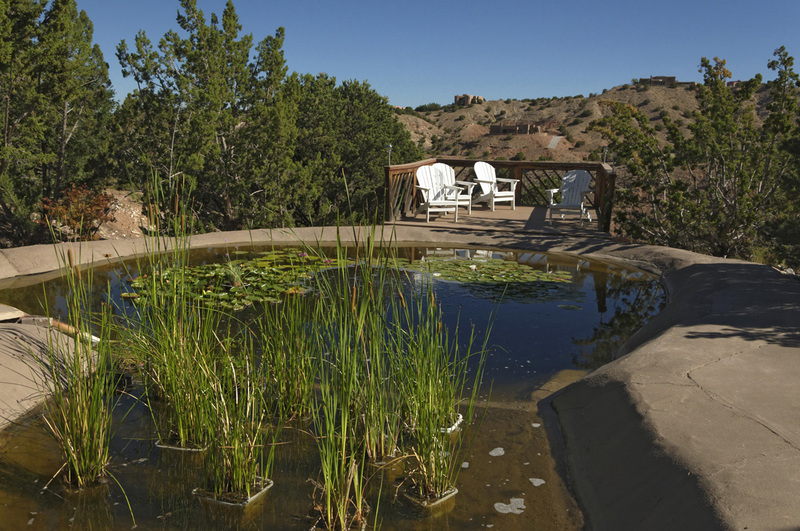 Enjoy the panoramic view of the far west mesas and the Jemez mountain area from this side of the property. The owners converted an existing concrete water fall to a series of raised planting beds to save on water loss. They shut off the fountain water, filled in the surfaces with amended soil, and planted flowers and perennial plants, now irrigated by an automated drip system. The Anasazi Fields Winery (AFW) sits on the western edge of the Village of Placitas. Per the “Wines in a Landscape” website description, the AFW wines “come forth from a unique landscape: a landscape of spring-fed orchards, a landscape of artists and poets, a landscape of weather and topography, a landscape of science and magic.” The prose sums up the Vintner’s growing philosophy, science background, poetic and sculptural talents, while describing the AFW “Wild Cherry Farm” orchard located about a mile southeast of the Winery and just north of the Village of Placitas. 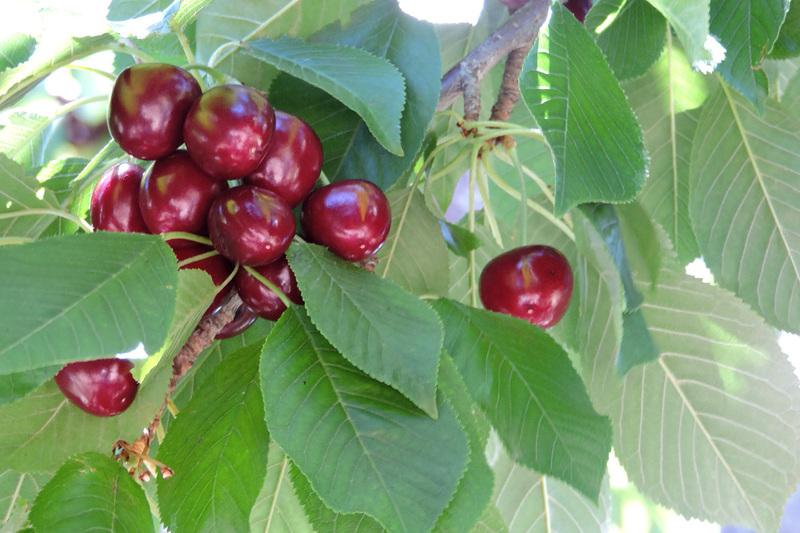 Anasazi Field wines are predominantly crafted from fruits such as grapes, peaches, plums, apricots and wild cherry varieties grown locally. You can explore several garden areas and learn about different gardening practices at this property. A brightly painted artist studio and porch are the back drop for hanging tropical flowering plants. Follow the pathway through the back gate to tour their hoop house garden structure which shades and protects raised garden beds filled with soil and straw bales. Savannah grows a variety of beautiful vegetable specimens. The vegetable bounty is at its height in late summer, but there should be early varieties for view at the time of the tour. 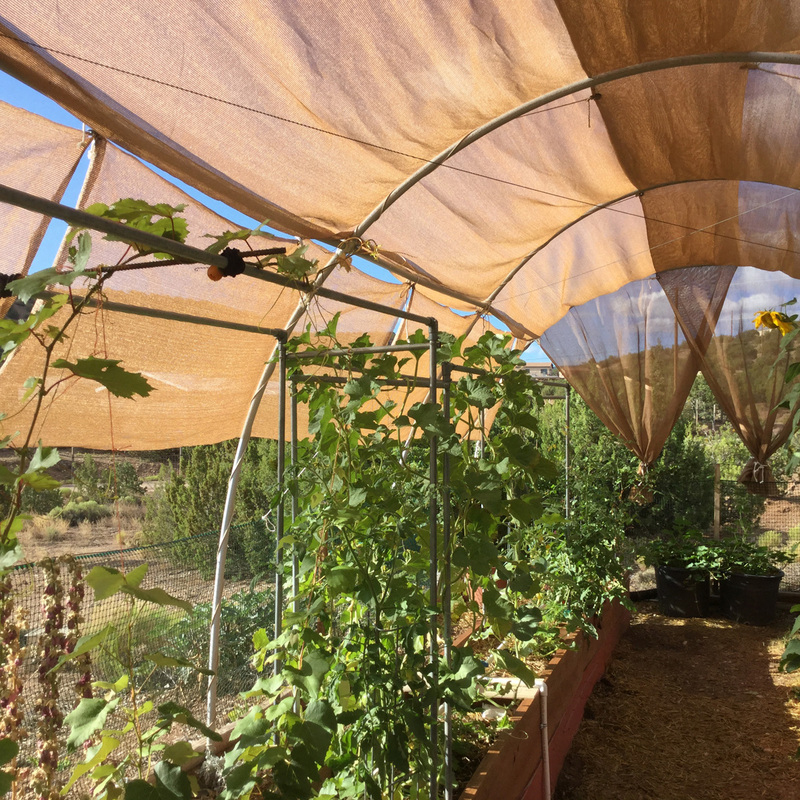 A hand built A-frame green house, which was featured in the Mother Earth News in January of this year, allows for an early start on vegetable and ornamental plant growing.